Unique German aircraft that used the flying-wing concept. 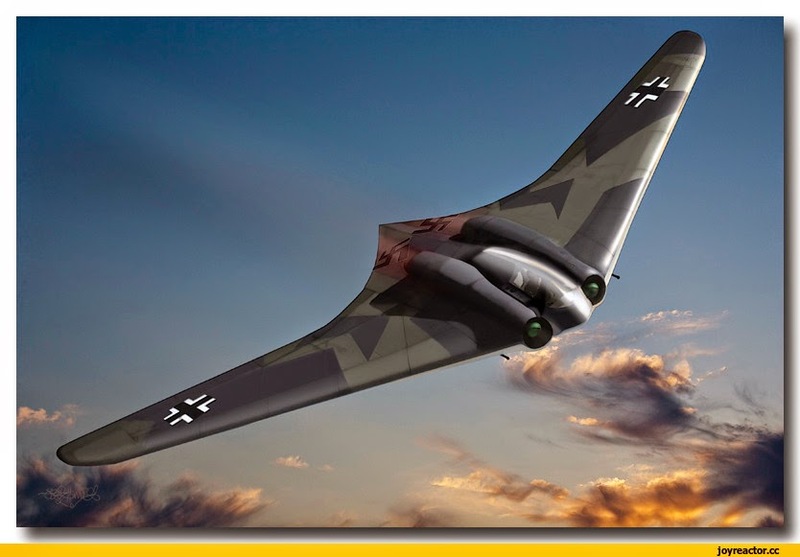 German engineers Walter, Reimar, and Wolfram Horten were designers and builders of flying-wing aircraft, beginning with gliders, from the end of the 1920s to the late 1940s. 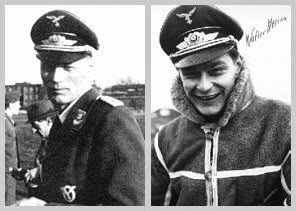 (Wolfram was killed in combat in 1940, Reimar died in 1993, and Walter died in 1998.) Their first manned glider, the Ho 1, designed in 1931, flew in 1933. A series of gliders were designed and flown to evaluate various configurations and structures, culminating in five models built for powered flight—the Ho V, Ho VII, Ho VIII, Ho IX, and Ho XII. The Ho V, built in 1937, was powered by two Hirth HM60R 80-shp engines and was the first Horten aircraft to demonstrate commercial or military potential. 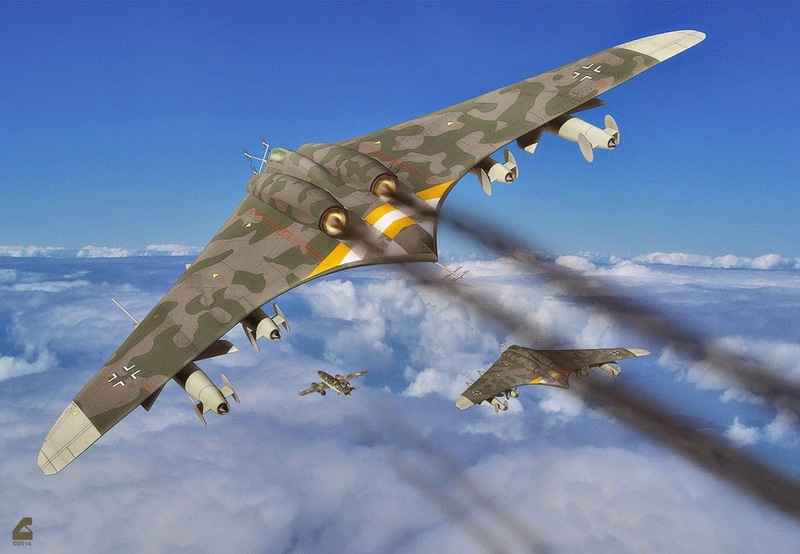 (However, the first actual military use of Horten aircraft was when several Ho IIs and IIIs were converted to freight-carrying for demonstration of capability to carry materials across the English Channel.) Two Ho Vs flew, both with two seats, one of mainly plastic, using sheet, sandwich, and laminate, the other a plywood-covered steel-tube-center structure and wooden outer wing panels. A crash of the first version demonstrated that the brittleness of the plastic made it an unsuitable material. The second version was rebuilt with a single seat for an upright pilot versus the prone pilot cockpit for the first version and some previous Horten aircraft. The Ho VII, designed as a trainer for pilots flying allwing aircraft, was a scale-up of the Ho V, being powered by two Argus AS-10-C 240-shp engines. Three were ordered, but only one was completed; it flew in May 1943. A production contract for 20 Ho Vs was received in 1944, but none had been delivered by war’s end. The Ho IX was conceived as a fighter-bomber, with wooden wings and a welded-steel-tube structure (all plywood- covered) with jet engines. The Hortens had been aware of jet engine development, and the concept of the Ho IX was stimulated by witnessing a flight of the Me 163 in August 1941. Starting in early 1942, concepts were designed around the Bramo/BMW P3302 engine, then the smallest diameter engine available. Construction started in June 1942.When the Hortens were advised in late 1942 that the P3302 engine had been canceled, they selected the BMW 003 as the next-best. Its larger diameter necessitated redesign of the already-started center structure. In early 1943, an opportunity arose to propose the Ho IX design to meet a requirement for an aircraft to carry a 1,000-kilogram bomb 1,000 kilometers at 1000 kph, which they did, receiving contract coverage in August 1943 for two prototypes (V1 and V2). About this time, Horten was advised that the BMW 003 was not going to be qualified when expected and that the Jumo 004 would have to be used. It was decided to complete the V1 as a glider with fixed landing gear so as to quickly gain flight experience. The V2 was started shortly after the V1, and its center section was also redesigned for the BMW 003, but the existing structure was not reworked for the Jumo 004, as no change in size was expected. However, Jumo 004 engines were not obtained until March 1944 and were 20 centimeters greater in diameter than anticipated because the accessory section had been changed. The Hortens were not receiving official communications on engine status because sometime before engine delivery their contract had been canceled by the Reich Air Ministry. From that time, the Ho IX’s continuing development was unique in being “bootlegged” from government funds without official sanction. Because of the delay caused by having to switch to the Jumo 004 engine, the V2 did not fly until 18 December 1944, seven months later than it would have had the BMW 003 been available. The V2 crashed on its third flight on 18 February 1945; however, by this time Gotha had been contracted to develop the production version (Go 229) and further redesigned the engine installation. Several Gotha prototypes were nearing completion when the war ended. The Ho XII was a primary trainer built without contract coverage, designed and built for a six-cylinder DKW engine, that flew without the engine in December 1944. There was no production. On 12 March 1945, the Hortens received a contract for the Ho XVIII, a four-jet long-range all-wing bomber. After the war, the Ho XVIII design was revised as a piston engine– driven transport, with no success. In 1948, Reimar Horten immigrated to Argentina and there designed the IA.38, about two-thirds the size of the Ho VIII, powered by four 450-shp engines, with a payload of 6 tons. In the 1930s and 1940s in Germany, the Horten brothers, Walter and Reimar, built a range of planes that they called the `Ho' series. The first of this series, the Ho I, was a simple flying-wing sail plane. By the end of that decade the brothers had developed the Ho III, a metal framed glider that was fitted with a folding blade propeller for flight. Then in 1944 they finished the prototype HO IX, their first combat intended design, powered by the Junkers Jumo 004B turbojets, the craft had a metal frame and plywood exterior It made its maiden flight on 2nd February 1945 and satisfied with its performance, the Air Ministry ordered forty of the craft to be built by the Goetha Waggonfabrik under the designation Ho-229. When the US Third US Army Corps reached the Goetha plant on 14th April 1945 they took over the factory, and shipped back to the US the near completed HO IX V3. References Dabrowski, H.P. Flying Wings of the Horten Brothers. Atglen, PA: Schiffer, 1995. Horten Ho 9. Atglen, PA: Schiffer, 1999. Myra, David.Horten 229—Monogram Close-Up 12. Boylston, MA: Monogram Aviation, 1983. I love the general shape of this Winged Air-Craftits a very Brilliant design by the Horton Brothers, even before Hitler gone to war;The first wing design ?was turbo powered,but later the Brothers choose Jet engines as an alternative, becuz of the simplicity of the jet-engine,s and avaialiable, of parts.But due to Later use it was fitted with 50 Caliber machine gun in front of the nose ,and it is very deadly ?when in close combat with Bombers or Enemy fighter planes,becuz they had a Machine designed like the american ""Gatling-Gun"",and spews 3,500 rounds per minute,lots of allied bomber went down in Flames ,becuz of this Nazi-German Machine -gun,during the war with British and american ,French fighter planes?these jets use Charcoal- Powder,fed under very high Pressure,into the jet engine ,becuz most of the Nazi refineries ?wer bombed and devastated! and to go to the charcoal mines? The Nazis use allied prisoners of war to go mine the charcoals,under very Harsh Conditions,a small percentage of the Prisoners Survie the horrific experiance inside the Mines,with lack of food and water!! !,by the way The American Gatling-Gun was a copy from the Nazi german plans ,retrieved from the Archives of Germanys Secret weapon,and the germans are so advance in their technologies ?they even hav the ""Haunebu-3 a disk shape craft ,that can remain invisible through the human eye,and that too is secretly in american hands,what we see in the United States ,about Flying Sausers ?are actually stolen german,disk,called the Haunebu 1 and Haunebu 2 and three!! !